After the successful launch of North India's tallest residential development, North Eye, Supertech Limited has announced the launch of yet another one of its kind, grandeur project, 'Supernova', which is North India's biggest mixed-use development spread across 5 million sq. ft. of area. The project has five towers amongst which 'Spira' – The Iconic Tower is India's tallest mixed-use development having 80 floors which stand at 300 meters. Supernova being a mixed use development project has residences, service apartments, hotels, shopping malls, office spaces and recreational centers. The benefit of mixed use development redefines Supernova as an epicenter. The project unveils opulence, luxury and elegance, with the world class luxurious modern conveniences. On the occasion of the launch of Supernova, Mr. RK Arora, Chairman & Managing Director of Supertech Limited said, "With the dream of providing a world class architectural masterpiece, we are launching this spectacular project, which has five state-of-the-art world class towers including the India's tallest mixed use development that has 80 floors, which stands 300 meters high". The poor cousin from Mayaland never looked this close to eclipsing the Millennium City, which is now an urban sprawl with a creaking infrastructure. Rapid unplanned growth has been Gurgaon's bane, while Noida rides the twin advantages of better planning and competent trunk infrastructure. The unveiling of the state of-the-art Formula One racing track in Greater Noida and the world-class Yamuna Expressway leading up to it have sent a frisson of concern coursing through Gurgaon on Delhi's southern border. Suddenly, there's a buzz about the poor cousin from the east side. Almost overnight, the badlands of Mayawati Pradesh have transformed into a Shanghai miracle with a scale and quality of construction not seen before in India. And it's threatening to put swanky Gurgaon in the shade. Lucknow is set to lose its political power as 3 new districts are set to gain all important power: Meerut (Harit Pradesh), Varanasi (Poorvanchal) and Jhansi (Bundelkhand) as plans unfold for trifurcation of Uttar Pradesh in 3 more states. The maximum power would flow to Meerut (Harit Pradesh) as it contributes about 72% of total income of undivided UP but gets allocation of only 18%. Presently, UP has the second largest economy ($400 billion based on PPP and $109 billion nominal) in India after Maharashtra, 72% of this would would take the new state economy sixth only behind Mah, AP, TN, Guj and, WB (StatesGDP-Link). While more details emerge, the upcoming Harit Pradesh would rise from ashes and would be ready to take on the best of the Indian states on each parameter of development and tourism (Agra Taj, Mathura, F1 and Yamuna Expressway are only a trailor- story abhi baki hai). While Meerut had been in contention for the new capital for long, it is Noida/Greater Noida/ Yamuna Expressway Authority that would be the financial capital of this new state. Noida already hosts most of the Indian TV channel offices in Film City so marketting would not be a problem for the state. The state already has metro to Noida and Ghaziabad and soon Meerut would have a high speed train corridor. A large part of Harit Pradesh is already part of NCR (National Capital Region). Agra (Taj) and Mathura (temples) would also get their dues that they could not get from undivided UP. Chief Minister of Haryana Bhupinder Singh Hooda has laid the foundation stone for the extension of the Rapid Metro Gurgaon. 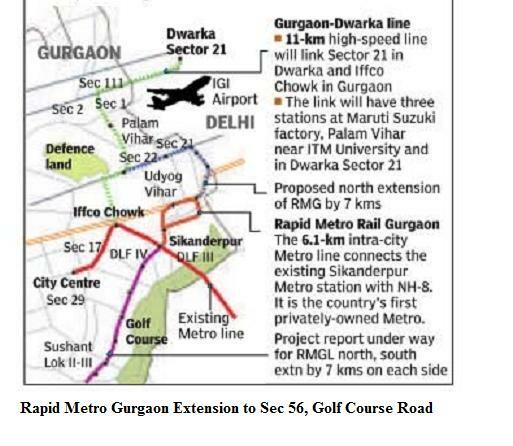 The proposed 7km South Extension of Gurgaon metro, once operational, will run from Sikenderpur station of Delhi Metro to Sector 56 in Gurgaon. The public private partnership (PPP) project implemented on DBFOT – design Build Finance Operate and Transfer – mode will be developed with an investment of $41.18 million, which will be funded out of mix of debt and equity. Construction work is expected to start by January 2013 and is scheduled to be completed by July 2015. The route will have six stations and 12 trains are planned, each with three cars – both phases – for 15 minutes trip time with 2-4 minutes headway. 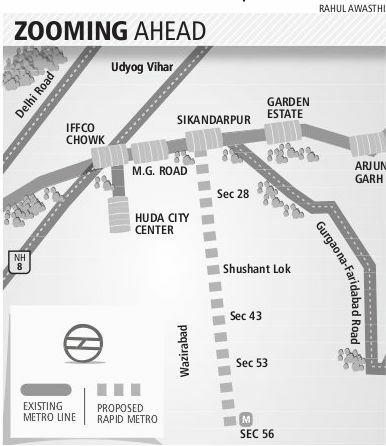 Land required for the project along road meridian will be made available by the government of Haryana. The structure proposed is a double track standard gauge elevated viaduct along the road median. The structure will be designed to match the existing environment of the millennium city.